Fruit crisps are among the long list of inhabitants in that world. How can that be? Well, I've never been one for fruit desserts growing up. I was always the girl who preferred chocolate without fail. I'm basically still that girl but I've expanded my horizons, and my palate, quite a bit in the last few years to include a taste for a wider variety of things. This past weekend, we went apple picking. It was more like apple, pumpkin, and tomato-picking (I not-so-secretly enjoy picking the grape and cherry tomatoes best of all and now have an extra batch of roasted tomatoes stowed in the freezer). The fresh apples we walked away with, as well as this Fall season, inspired me to tackle fruit crisps. They always appealed to me on a small scale - being less complicated than pie and more manageable for my family and I to polish off (though we couldn't convince the little man to join in...he's currently like his mother when it comes to a preference for chocolate over fruit, I'm afraid). Then I got to thinking: why just limit it to apples? I have not forgotten pears since I talked about it about this time last year and I've been making sure to buy and eat plenty of them. So I thought I'd make two individual-portion crisps - a pear and an apple. 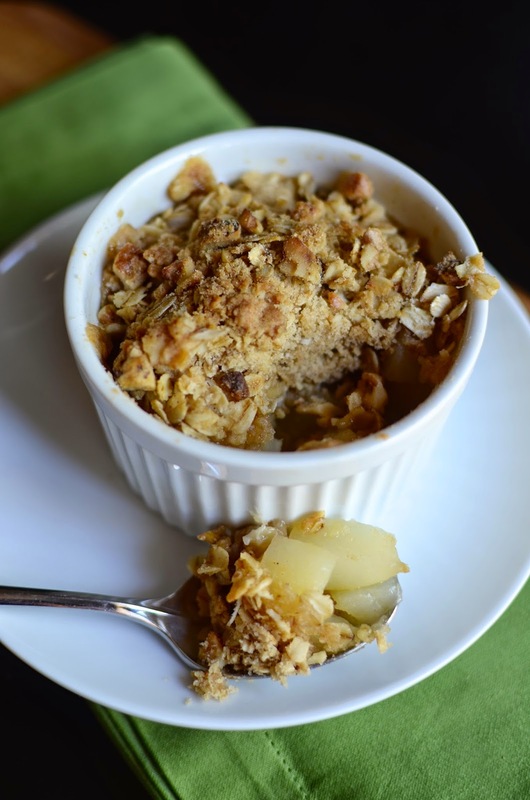 I used the same streusel topping for both - a classic combination of oats, flour, brown sugar, cinnamon, and butter. I also added some chopped walnuts because, for me, nuts usually make things better! 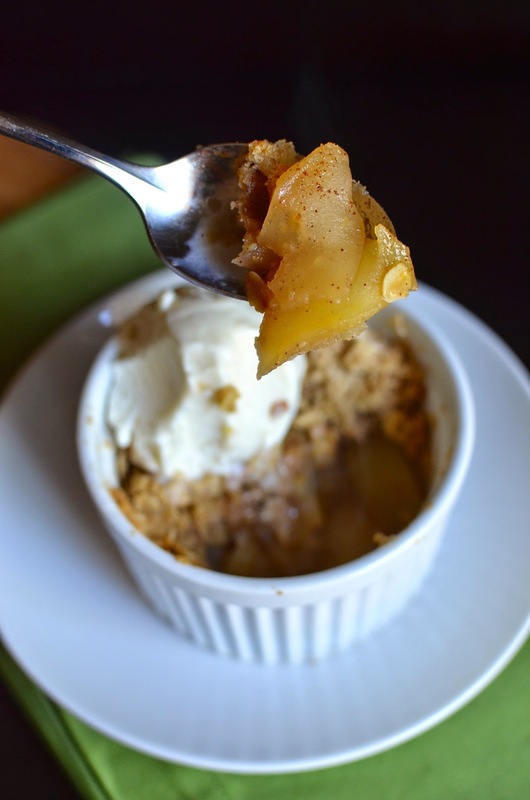 For the apple crisp, I tossed the thinly sliced apples with some cinnamon and brown sugar. For the pear crisp, I coated the diced pears with granulated sugar, a pinch of cinnamon, and a teeny bit of freshly grated ginger for a little zip. And when in doubt, add ice cream! 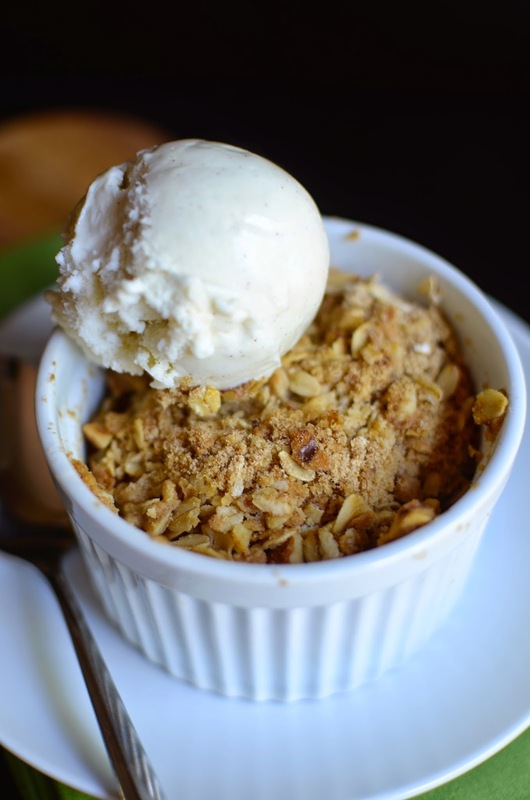 Warm desserts just scream out for a scoop of vanilla ice cream. Anything 'a la mode' works for me. I can now check fruit crisps off my things-to-make list. Never mind that there are something like ten thousand other things on that list! As much as I like to try out new recipes, I always fall back on simple stir-fry dishes for many of our family dinners. When time is short (and it always seems like everything needs to get done right around the dinner hour), it's easy to stir-fry up some meat, throw in some vegetables or tofu, and add a little sauce to bring it all together. Meanwhile, the rice cooker bubbles away and provides the rest of the meal. If stir-fry "recipes" are my secret weapon for putting a quick meal on the table, then I must have certain Asian pantry ingredients in my arsenal. The very basics include soy sauce and sesame oil; beyond that, I'd say oyster sauce is my secret weapon. I like to stir it together with some water and cornstarch - then pour it into the pan with what I'm cooking, and I have an instant sauce for my stir-fry. Today though, I'm thinking about another Asian pantry sauce that I like to keep on hand and use for both cooking and as a dipping sauce. It's hoisin sauce, or what translates into "seafood sauce" in Chinese. It doesn't actually have any seafood in it. Some call hoisin sauce the Asian barbecue sauce but I'd describe it as a thick, sweet sauce that has a certain umami flavor to it. It's made with soybeans, sweet potatoes, sesame seeds, and sugar, to name a few ingredients. Hoisin sauce is often used as a dipping sauce, slathered onto the wrapper or bun for Peking duck, for instance. We like to put some on Asian fish balls. When I was growing up, I loved drowning some steamed rice noodles with hoisin sauce for a snack or meal. The sweetness is a little addicting! I don't use it all the time but if you're looking for a quick Asian flavor boost for your stir-fry and you're in the mood for some sweetness, this is a good option (I particularly like to use it to make a sauce for diced chicken and cashew nuts). I often make stir-fry with ground turkey because my son loves it. For a little variety, I also like to use ground chicken. This stir-fry dish here is simply ground chicken cooked with some grated garlic, ginger, and scallions. A simple mixture of hoisin, soy sauce, water, and sesame oil makes for a quick sauce. I topped it with some crunchy peanuts and served it over rice but it makes a great filling for lettuce wraps. If I had some shiitake mushrooms on hand, it would be great in this dish, as would some shredded carrots. That's the beauty of a stir-fry; you can add so many things to it and use what's lingering in your fridge. Repurpose leftovers...and make spring rolls! I was watching the Pioneer Woman this weekend and the show was called "one thing leads to another" and that's what I had in mind here. I'm saving some leftovers to make something else. Now, speaking of leftovers, I've come to truly appreciate it to the point of making sure I make too much so that I'll have leftovers! When I was making this Asian chicken stir-fry dish, I thought I'd reserve some and use it as a filling for...spring rolls. You see...I've wanted to make spring rolls at home for ages now. This is actually my inaugural batch. Years ago, I'd always opt for the crispy, fried kind but being more health-conscious in recent years, I now go for and appreciate the soft kind of spring rolls that you'd typically find filled with shrimp, vegetables, and some thin vermicelli noodles. Unfortunately, the ones I order at restaurants are often hard and dried out so making some at home, to eat fresh, has been a goal. So right in time for Fall, I made "Spring" roll...but I think this warm version makes a nice snack/meal at any time of the year. It took me this long to make spring rolls because they always seemed a bit of a project, requiring you to steam shrimp and chop up/prep the various fillings to do the job. Well, I had the idea to go for a bit of a short-cut, by using some appropriate leftovers as a filling, when I saw this post that uses leftover peanut noodles as the primary ingredient for the rolls. I thought it was a great idea, and I could picture lots of possibilities. In short, re-think spring roll fillings! (Though maybe I'm the only one who'd never thought of the possibility!) Repurposing leftovers like this cuts the prep time down and makes for tasty results. So for my shortcut rendition, I used some leftover ground chicken in hoisin sauce we had the night before as the primary filling in my spring rolls. I added vermicelli noodles (that only require a few minutes soak in hot water, which I then used to soak my wrappers) and some shredded carrots (another easy task thanks to my julienne peeler). Best part - I made the easiest, 2-ingredient dipping sauce by stirring a little bit of warm water into hoisin sauce to thin it out. It was fast and very tasty! When I go to the big bookstore (you know the one since there are so few nowadays), I'm always drawn to the magazine racks and to the cooking magazines. These days, aside from the usual monthly issues, there are all these special edition magazines featuring everything from seasonal cooking/baking to one-pot meals. I'll find myself flipping through these mini cookbooks and with all the great photography, everything looks delicious. Every once in a while though, for whatever reasons, something especially calls out to me. This hazelnut marble coffee cake did that the other day and I just wanted to make it. I wasn't really sure what it was that made me want to make this little cake so much. I supposed we simply like what we like, and this cake has a lot of the characteristics that I like in a cake. I'm a big fan of basic cakes that don't need frosting; I love hazelnuts and anything with chocolate (the duo/marbled layers really appealed to me). I've also realized that old-fashioned coffee cakes need to make a serious come back and that crumb toppings are something to swoon over. As it turns out, this was also something of a light recipe - another thing that appealed to me because ideally, I'm looking for tasty, balanced, treats I can enjoy everyday. But I have to admit I started second-guessing my decision to try this out when I looked deeper...I started thinking: "Really? Just 1 tablespoon of butter (never mind that the original recipe uses vegetable oil spread) for the crumb topping? Light sour cream, 7 tablespoons of water and just 3 tablespoons of canola oil in the cake?" Is that going to taste good? I decided to go for it and give it a try. The recipe left some room for interpretation as far as using other types of flours and even sugar substitutes. I stuck with the framework of the recipe but used a tablespoon of butter (as opposed to oil spread) for the topping, an actual egg (instead of egg product, which I've never bought) in the cake, and I choose to substitute half the all-purpose flour with whole wheat pastry flour. A little extra vanilla extract worked out well, too. I really wasn't sure this coffee cake would taste as appealing as it looked in the magazine but the good news is it was very good! The cake is moist and tender, and you can taste the cocoa of the top layer. That really makes a difference, adding some dimension and giving you the feeling that you're eating some hybrid between coffee cake and a marble loaf or light pound cake. Though the cake itself isn't very flavorful, it goes nicely with the strong flavor of the crumb topping. The hazelnuts in the topping packs a punch of flavor. If you're not a fan of hazelnut, I see no reason not to substitute with something else like walnuts or almonds. 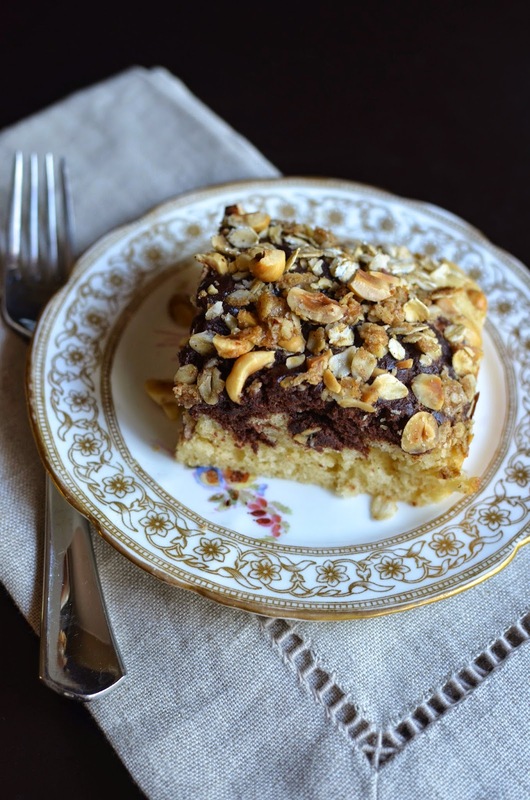 For me, the hazelnuts work really well with the cocoa layer and gives you a ton of flavor in the topping. And speaking of the crumb topping, I found that just one tablespoon of butter and 1 tablespoon of brown sugar does get the job done here! If you are feeling generous (or a little greedy), I wouldn't discourage anyone from making a bit more topping to go on top of this coffee cake. Thanks to those flavorful, toasted hazelnuts though, I think it works just as it is. You know I love eggs, and for so many reasons. I always think it's a treat when I see baked eggs on the menu at a restaurant. Poached eggs, sure, but I rarely see baked eggs on the offering so I get excited when I do spot it. Somehow, baked eggs feel like a treat...maybe it's just me but there's something seemingly luxurious about it. It's a wonder I've never made it at home. As basic as it sounds, it's been on my list of things to whip up one day at home and I finally did it over the past weekend. This is your blank canvas of baked eggs. I simply baked the eggs with some salt and pepper and a drizzle of whole milk. We had turkey bacon and some toast soldiers on the side with it. It was a fun way to have eggs differently for breakfast. Variety keeps things interesting and gives us something to talk about (well...picture me going on and on about eggs...) so it's definitely a good thing. I think I might have figured out why baked eggs seem so luxurious to me when I order it at a restaurant. Aside from the fact that it takes a little extra effort to make, it just might be the heavy cream and likely cheese and other little touches that have been added to it. At home, I settled into a more modest, simple baked egg but, as you know, the possibilities of adding flavor and dolling them up are almost endless. You can incorporate any and everything from cooked onions, leeks, spinach, tomatoes, and mushrooms to adding some herbs, cheese, and bacon or ham to it. Water bath or no water bath? In an effort to try and provide some value-add here today (I can't promise that all the time...as you have no doubt realized, this blog is all about the random, chocolate-leaning, whims of a true amateur), I thought I'd try to figure out whether a hot water bath is necessary when it comes to making baked eggs. If you've looked into this, you've no doubt seen recipes that call for a water bath to set the eggs into when baking and others that make no mention of any such thing. I was curious and did a little testing. In my distinctly unprofessional opinion, I'd say you should use a water bath. I found that the one baked in a water bath cooked more gently and evenly through (on the left, above), meaning I ended up with a softer, smoother-textured baked egg. The egg baked in the oven without a water bath was good but not as silky. I would note that the egg baked without the water bath cooked quicker. Depending on how you look at it, that might be a good thing and the overall convenience might sway you into making them that way. In general, I'd just say that keeping a close eye on the eggs while baking is the most important thing to do when making these. For me, I like my egg yolks runny and soft while the whites are just set. To me, chocolate chip cookies equal comfort baking and eating. They're easy to make and delicious to eat so there's a big payoff. So when I have some free time, I often get the notion to make a batch. I like to make the dough, let it sit a day or so in the fridge, and bake some up to enjoy with my fellas. I usually freeze a few to have on standby but they rarely last more than a week or two in the freezer. 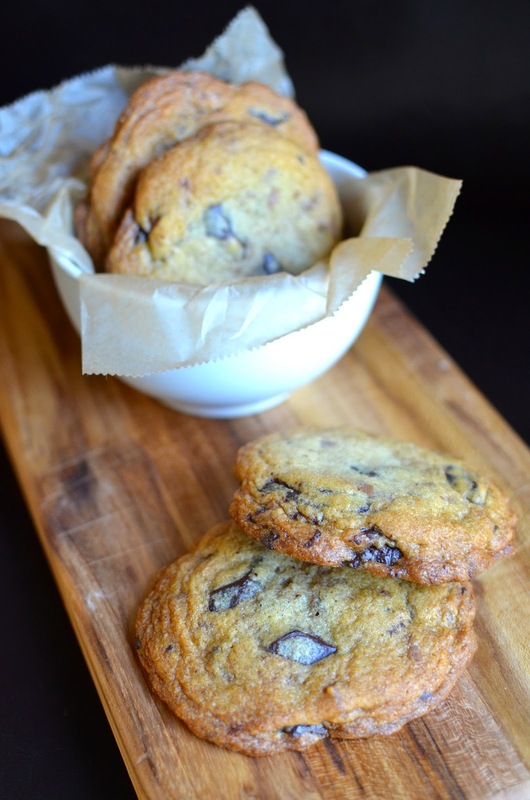 Like brownies and oatmeal cookies, I've met many a delicious chocolate chip cookie. I have my favorite go-to recipes but it's fun to try a different version every once in a while. There may not be a whole lot of differences among chocolate chip cookie recipes but some little nuance or twist in a recipe can make a difference. In this case, I thought of the chocolate chunk cookie recipe from Flour Bakery. I've made a few great recipes from the first cookbook (these milk chocolate hazelnut cookies are incredible, and then there were those surprisingly-easy homemade Oreos). When we visited the bakery in Boston, we had one of their chocolate chip cookies made with TCHO chocolate. I'm not sure if it was the TCHO chocolate that made the difference but it was really delicious. With that memory in mind, I went ahead and gave the chocolate chip/chunk cookie recipe a try. You have the basics of the classic chocolate chip cookie here: butter, brown sugar, granulated sugar, chocolate, you know the drill. The nuances in this particular recipe is the use of some bread flour (which might very well make you think of those thoroughly-talked-about Jacque Torres/New York Times chocolate chip cookies) for extra substance and chew, as well as a little milk chocolate thrown in with the dark. As a child, all I knew was milk chocolate. In recent years, my taste preference has definitely gone over to the dark side. It'd been the same way for my husband but recently, he and the little guy have renewed their affinity for milk chocolate and I have to say that it has its place in many desserts and even works better in some cases than dark chocolate. In this particular instance, the smaller bits of milk chocolate are a great partner to the larger chunks of dark chocolate. It adds a caramel flavor and sweetness to the background of these cookies that I was a big fan of. You know...I have to say that I've yet to be able to mimic that bakery-style chocolate chip cookie texture that I love. I'm talking about the hefty ones that are super crusty and firm yet also chewy and melding at the same time. The home versions are just not quite that extreme somehow. I keep thinking it has something to do with professional versus home ovens but I'm not sure. All I know is that at home, I get wonderful oven-fresh cookies and I can do myself the favor of using the best ingredients I can find. That's especially true when it comes to the chocolate. 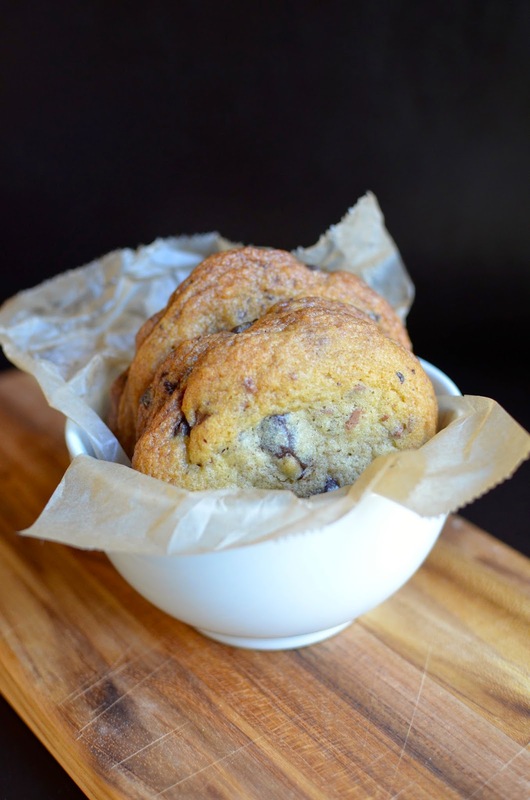 Use good stuff and what you like to eat because you can taste it in chocolate chip/chunk cookies. In this case, a darker chocolate (higher % cacao, say 60%-70%) works really well as it contrasts with the smaller bits of sweeter milk chocolate within. So while these cookies I made at home aren't precisely the one we bought and ate from Flour Bakery (I didn't notice any milk chocolate at the time), they were certainly delicious. Crisp and dark at the corners, soft in the center, my favorite thing about them was the flavor - the caramel-butterscotch undertones against the chunks of melty dark chocolate. Chilling the dough at least overnight, or for a few days, in the refrigerator to develop the flavor and color is a very good thing to do. It's time for a back-to-school cake! I almost forgot about this little tradition of mine because time has been flying by and there just doesn't seem to be much time to think or plan too far ahead. Luckily, I remembered in time. What we usually do is very simple...we have a little celebration dinner after the first day of school. The idea of having a "back-to-school" cake to cap it off is just a fun excuse for us to make and enjoy a cake together. I was inspired to make a chocolate chiffon cake for this year's back-to-school cake for a few reason. I just love plain chiffon cake - the fluffy, light, moist texture with the lovely richness from using not only egg whites (i.e., angel food cake) but also egg yolks. I'm devoted to its simplicity though I've made (and adored) a banana-chocolate version as well. 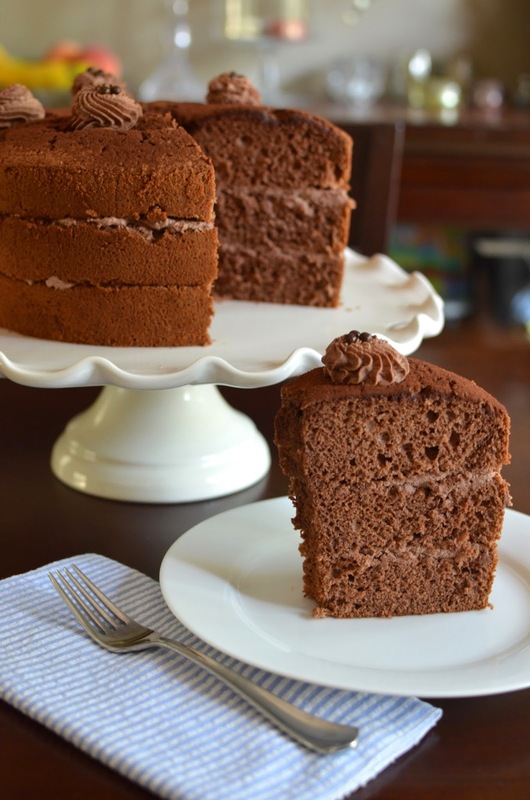 And not long ago, someone asked me about suggestions on how to make a chocolate chiffon cake. That got me thinking that I would like to try a full-on chocolate version myself! Being that the little guy loves chocolate almost as much as I do, I thought I'd make it for our back-to-school cake. Since my now fourth-grader adores frosting and creamy fillings (way more than I do! ), I thought I'd add some to this chiffon cake. The original recipe for this cake suggested mocha whipped cream as well as a chocolate glaze. My son's love of coffee-flavored treats seems to have waned recently so I went with cocoa - rather than mocha - cream. To keep things simple and a bit less decadent, I opted not to glaze the cake. This had me thinking about a delicious cake, called the "Windmill" at New York's Veniero's that I love and have not had in way too long. This isn't quite the same but will do until I get a chance to go there and share a slice or two of it with my fellas. I'm glad I decided to skip the chocolate glaze. I mean, it would take a lot to cover this tower of a chiffon cake! And seeing how lofty it turned out, I decided to slice it into 3 layers to divvy up the cocoa cream between. I used a cup of cream and you'll have just enough to give it a relatively modest coating between the layers. I may be firmly on team "plain chiffon" but if you're looking to change things up or hankering for a light, spongy cake with some chocolate flavor (instead of a dense chocolate overload - which is not by any means a bad thing, in my book), this is one to consider. The cake is as light, moist, and bouncy as you'd expect and require a chiffon to be. The chocolate flavor is relatively mild. For more of a chocolate hit, adding a chocolate glaze or grating some chocolate into the batter (like I did here) are good options. Whereas I would not want to detract from a plain version in any way (I adore the pure egg flavor of it without cream or other accompaniments), I think the cream filling works really well for this chocolate rendition. My fellas (my husband and my son) certainly enjoyed it. This is a lot of cake, yes, but you'd be surprised by how easily it goes down and how quickly a big slice disappears! Back-to-school day this year also happened to be my brother's birthday and I was able to deliver a few slices for the birthday boy to enjoy at his leisure. There was plenty of cake to go around and that's a good thing because cakes are made for sharing (I only hoard occasionally). Tomorrow, my son heads back to school. For us, it's the unofficial signal that summer is over...and, as usual, the feeling is a little bittersweet. I'll miss the freedom of summer, that attitude of not taking anything - from schedules to "to-do" lists - too seriously. We trade that in for a world filled with a little more structure and routine once again. I'm not altogether against that so I have mixed emotions. What I resolve to do is accept and appreciate. I actually enjoy the change in seasons, having different things to look forward to at different times of the year. And as we all know, the clock continues to tick (quickly) and given the inevitability of it, it's best to simply embrace it. While I'm sorting out all my feeling and organizing schedules, I thought I'd drop in here with a simple pasta dish. Spaghetti aglio e olio, or spaghetti with garlic and oil, is one of my all-time favorites. This version calls for anchovies and I think it's all the better, more flavorful, because of it. It's one of those almost-pantry pasta dishes that I love to whip up when I want something easy yet hearty and comforting to eat. I call it "almost" pantry pasta because of the parsley - it's kind of a must-have in this dish and for me, that often requires a trip to the grocery store. Since I go to the grocery store several times a week, it's not much of an issue for me. All the talk about spaghetti carbonara recently had me thinking about this simple pasta - inexpensive and quick, yet tasty and reliable enough for company or just as a quick dinner when you're busy like we all will be heading into the Fall. The last time we had this, about a week or so ago, I had some meatballs on hand so I plopped a few on the side for the fellas. This pasta is great with some protein but I love it just as it is, with nothing else. The anchovies and garlic, not to mention some good olive oil, packs the pasta with a lot more flavor than you might expect. Maybe this is already a family favorite of yours...or maybe you have other quick-easy-and-delicious dishes up your sleeve for the busy months ahead. If that's the case, please share!